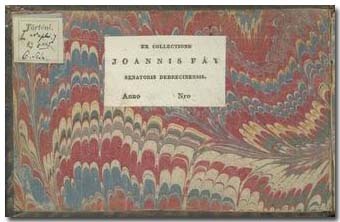 János Fáy of Fáj was born on January 26, 1773. His father was János Fáy (c. 1716-1783), town councillor, Mayor and Chief Justice in Debrecen, from the Catholic branch of the Fáy family; his mother was Anna Klimó, sister of György Klimó Bishop of Pécs. She was the second wife of her husband, and at his death his possessions were distributed amongst her and their seven children. János Fáy Jr. first lived in Emőd (Borsod county), and then, after being elected town councillor of Debrecen, he bought a house and established there. From 1823 on he was Mayor of Debrecen and judge of the County Court. He married Petronella Sigmondffy, but they had no children. He died on December 28, 1833. His collectionism was most probably inspired by his uncle, the Bishop of Pécs. The valuable pictures, rare books (including old Hungarian prints), manuscripts and albums, coins, weapons, ancient objects and natural curiosities collected by him astonished several contemporaries of him. Unfortunately, no list of them has survived. He left by will all his collections to Alajos Fáy, the son of his cousin Bertalan Fáy, County Lieutenant of Tolna, in order he would keep it together. Nevertheless, after two generations this national treasure was dispersed through various channels of art trade, and only some pieces of it got to national collections.